The world’s biggest automaker is driving onto the world’s biggest sports stage. Toyota Motor Corp signed on as a global Olympic sponsor Friday in a landmark deal reportedly worth nearly $1 billion, becoming the first car company to join the IOC’s top-tier marketing program. The eight-year deal underlines Asia’s growing influence in the Olympics, bolsters the IOC’s long-term financial security and gives Toyota a worldwide platform that shuts out rival auto manufacturers. The deal starts globally in 2017 and runs through the 2024 Olympics. It will cover three consecutive Olympics in Asia, including the 2020 Tokyo Games on Toyota’s home turf. The International Olympic Committee’s TOP sponsorship program gives companies exclusive worldwide marketing rights and permission to use the Olympic rings in advertising. Terms of the deal were not announced, but Japanese media reported Toyota will pay $835 million — a record by far for any IOC sponsorship deal. Four-year TOP sponsorships have usually sold for about $100 million and eight-year agreements $200 million, so the Toyota deal represents four times that. Toyota joins as a sponsor in the new “mobility” category. Toyota becomes the third Japanese company to become a worldwide Olympic sponsor after Panasonic and Bridgestone. Toyota also becomes the 12th TOP sponsor overall and third committed through 2024. Other TOP sponsors include Coca-Cola and McDonald’s. “This agreement is a powerful indication of the strength of the Olympic brand globally and the appeal of an association with the Olympic movement,” said IOC marketing commission chairman Tsunekazu Takeda, who is also president of the Japanese Olympic body and vice president of Tokyo’s organizing committee. The Toyota deal covers the 2018 Winter Games in Pyeongchang, South Korea, the 2020 Tokyo Olympics, and the 2022 Winter Games and 2024 Summer Olympics. The host cities for the 2022 and 2024 games have not yet been selected. Two Asian candidates — Beijing and Almaty, Kazakhstan — are bidding for the 2022 Games, with the IOC vote to be held on July 31. While Toyota will join the TOP program in 2017, it will have marketing rights in Japan with immediate effect. The agreement covers all Toyota brands, including Toyota, Lexus and Scion. Toyota will showcase its products at the Tokyo Games, including the Toyota Mirai, a hydrogen-powered vehicle that is eco-friendly and in line with the Olympic theme of sustainability. The car category has traditionally been only for sponsorship deals with national Olympic committees and local games organizers. Another Japanese car company, Nissan, is among the national sponsors of the 2016 Olympics in Rio de Janeiro. BMW was a domestic sponsor for the 2012 London Olympics and Volkswagen for the 2014 Winter Games in Sochi. BMW is a sponsor of the U.S. Olympic Committee in a deal that expires after 2016. Starting in 2017, Toyota will have exclusive rights in the more than 200 countries recognized by the IOC. The deal shuts Korean car giant Hyundai out of the 2018 Pyeongchang Games on its own territory. China, the world’s most populous country, will have no Chinese car sponsor if Beijing gets the 2022 Games. And if Boston wins the right to host the 2024 Olympics, the U.S. car industry will be shut out for its home games. Other TOP sponsors are General Electric, Atos, Dow, Omega, Samsung, Visa and Procter & Gamble. 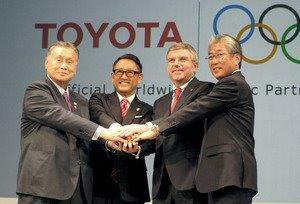 The Toyota deal is another example of Japan’s economic influence in the Olympics. Last year, the IOC awarded Japanese TV rights to a national consortium in an eight-year, four-games deal worth $1 billion through 2024. It also marks another success for Bach in ensuring the long-term financial security of the Swiss-based Olympic body. Last year, NBC signed a record $7.75 billion agreement with the IOC to extend its U.S. broadcast rights deal through 2032.